A camp leader needs to purchase the food supplies for an overnight camping trip for a group of 20 people. He has a limited budget for supplies and therefore has to minimize the food cost while still providing the appropriate number of servings of grains, fruits, vegetables, dairy products, meats, and sweets in order to meet the camp’s recommended dietary standards. You may have other problems to solve that are similar to this one, such as minimizing the cost of an advertising budget while reaching a targeted number of people in different demographic groups by adjusting the dollars spent on different types of advertising. Another example would be maximizing profit while meeting a budget limit by adjusting the amount spent in different departments. The balanced diet problem is complex enough to warrant using GeneHunter because changing the number of servings of one food group affects the number of servings from the other food groups. The problem is further complicated by the fact that the cost per serving varies substantially from one food group to the next, so a single extra serving of meat, for example, can eliminate several servings from other less expensive food groups. GeneHunter enables you to find a near optimal solution. The goal of the GeneHunter model is to minimize food cost while maximizing diet quality by varying the number of servings per person for each food group. Column B lists the six essential food groups. 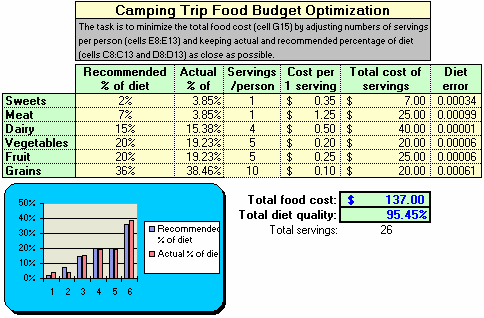 The camp’s recommended percentage of total diet for each food group is listed in Column C. The cells in Column D compute each food group’s actual percentage of the total diet that will be served if the GeneHunter model is used. This computation is based upon the number of servings per person that are listed in Column E for each food group, divided by the total number of servings for all food groups calculated in cell G17. Each food group must be served no more than 10 times per day. Step 1 – How Does GeneHunter Work?